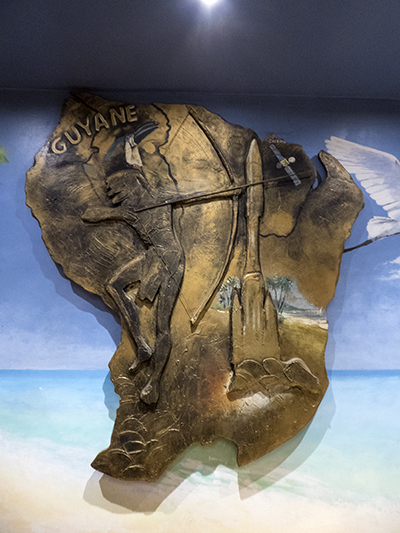 After a scintillating encounter with Lea Lund and Erik K. at La Galerie Africaine's art exhibition, Dandy & Sapeurs d'Afrique, Tom and I made our way up rue Blanche and rue Lepic to find our dining destination: the Antillo-Guyanese restaurant Armelle et Henri. We were the first customers of the evening and had our pick of the tables in the dining room. We chose to sit by the window so we could see the passersby in the street as well as have a perfect view of the island-inspired decor inside. Tom ordered a Caïpirinha, the famous Brazilian cocktail, and I ordered a Ti' punch gingembre, a small glass of white rum flavored with ginger syrup. “Ti' punch” means “small punch” and is a popular beverage in the Caribbean. Ever cautious about ordering too much food, we decided to split an entrée. 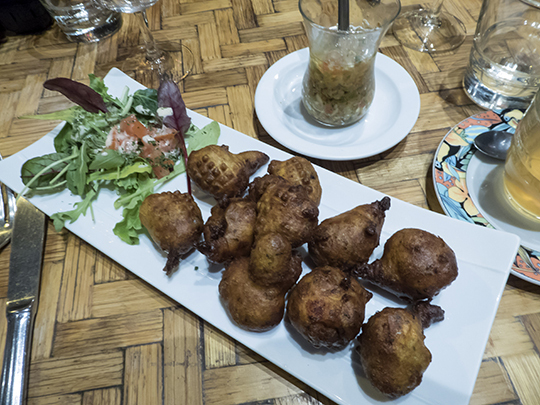 We chose accras de légumes and were rewarded with ten piping hot fritters served with a small salad of mixed greens and diced tomato. Our server placed a small glass of sauce alongside with the warning that it was extremely spicy (she used the word “violent”). She did not exaggerate! We found it to be just as flavorful as it was potent. 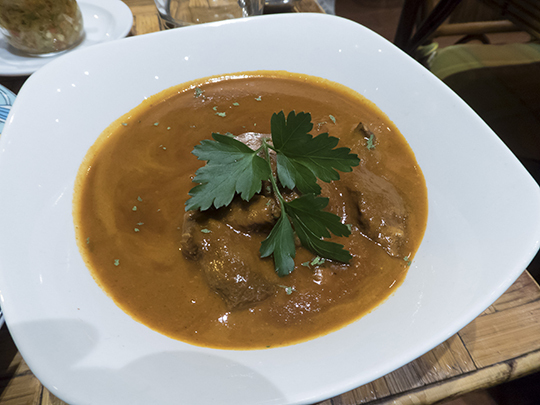 For the main course, I ordered Porc belle capresse, a serving of tender, marinated pork made with coconut cream, curry, tomatoes, and basilica. 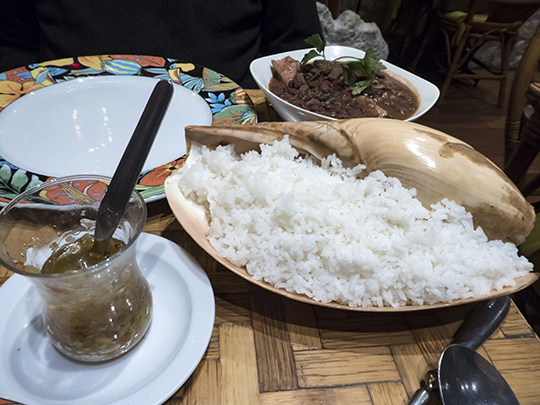 It was subtly-flavored dish that benefited from the addition of the “violent” pepper sauce. Tom decided to try the Cassoulet créole, made with pork belly, sausage, smoked chicken, pork, and red beans. It turned out to be a hearty, filling dish. Our server placed our main dishes on the table and disappeared into the kitchen without a word. Tom was ready to tuck into his Cassoulet but I told him to wait. We hadn't been served our rice! Just as I uttered these words, our server returned with our rice in the most unusual dish I've ever seen - a huge conch shell! I ordered a glass of Rhum arrangé gingembre to accompany this course. Two slivers of ginger root sat in the bottom of the glass I was served; they gave this beverage a more powerful ginger flavor than the ti' punch that I ordered as an apéritif. I had no room for dessert after my starter and main course, but Tom was eager to end the meal with something sweet. He ordered a Café gourmand agricole, which consisted of an espresso coffee, a ramekin of whipped cream, a ramekin of coconut sorbet, a small slice of vanilla cake layered with coconut cream and frosted with chocolate icing, a chocolate-flavored macaron, and a 2 cl glass of aged agricultural rum. He happily downed every morsel of the confections and downed every drop of the beverages, and declared that it was a fine way to end a fine meal! We enjoyed conversation with our server, who is also the manager of the restaurant. She told us that she is the daughter of the original owners, who have retired.